Luna Negra Dance Theater‘s Saturday night performance at the Harris Theater exceeded my expectations. I’d already seen two of the three pieces in rehearsal, but nothing beats the electricity and vibe of a live performance in front of a packed house. This internationally-eclectic and extremely talented crew under the direction of Gustavo Ramírez Sansano create beautiful, fun, vibrant and intricate tableaus in everything they perform. The partner work in each duet or pairing seems impossibly natural and easy, which, of course, it isn’t. These dancers are at the top of their game physically with exquisitely fluid technique and fine-tuned instincts. There isn’t one weak link. They are all dancing at their best and when combined with exciting and challenging new works (as they were again this past weekend), they are thriving. 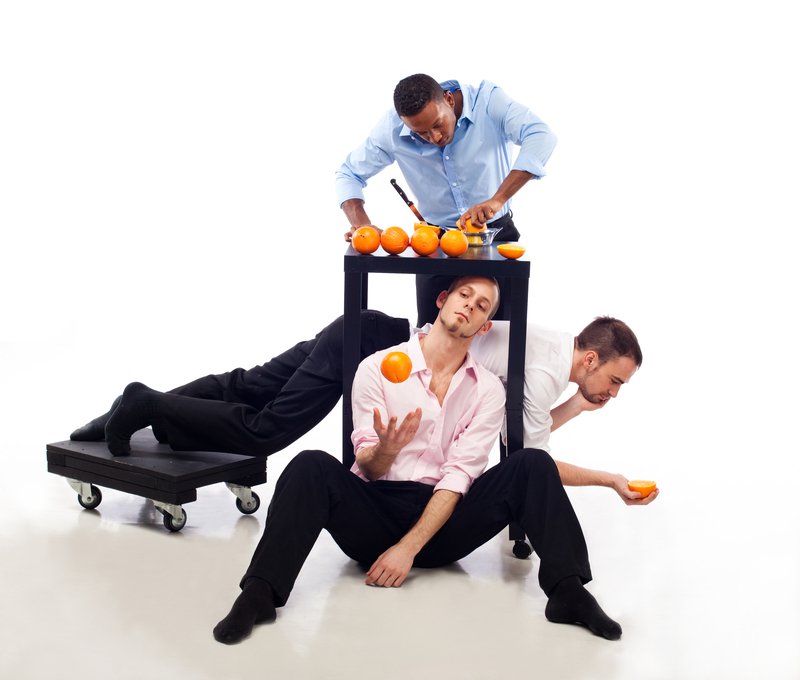 The opening section of Solo una Vez (Luis Eduardo Sayago) had the three men (Nigel Campbell, Zoltán Katona and Diego Tortelli – pictured above) working with oranges. Campbell as bartender, cut, squeezed and drank the fresh juice on stage and the men each tried to affix their half of an orange with another to recreate a whole. Aside from making me want a mimosa, the cute and kitschy scene about the search for your other half utilized the props more than the dancers abilities. Solo work by Tortelli and a duet with Stacey Aung and Nigel Campbell were stand outs. Fernando Hernando Magadan’s Naked Ape was my favorite piece of the evening. Katona’s role as emcee was added by Magadan recently and added an artsy twist to an already complex visual landscape. Speaking in his native Hungarian (hat tip to Zac Whittenburg! – I didn’t know what language he was speaking), he narrated some movements and manipulated others, joining in with his own interpretation. Featuring Katona, Tortelli and Aung as well as Monica Cervantes and Eduardo Zuñiga, this avant garde take on human communication and technology felt a little NDT (the choreographer’s current company), a little Cirque du Soleil and a whole lot of trust, control and talent. Ending with Sansano’s Flabbergast was a perfect (and fun!) conclusion to the evening. With the entire company together on stage, it showed that they are ready, willing and able to entertain, challenge and surprise us at every turn. One of the things that struck me was the individuality of the dancers. Each person had a physically unique way of moving and this individuality came across even in the unison sections. It was a wonderful blend of different tastes that made a delicious whole. “They are not clones,” Sansano says. “Each individual is an ingredient.” RB likes what he’s cooking. UPDATE: Ahh, I forgot to mention the lovely ladies’ solos in Flabbergast by Veronica Guadalupe, Kirsten Shelton and Reneé Adams! I couldn’t agree with you more, but you said it better than I ever could have. Thanks! I’m really enjoying watching this company evolve.